Prof. Daniel Lantum, in the following interview solicited by The Post, talks about the life, upbringing, education and teachings, work and legacy of the Genuine Intellectual, Prof Bernard Fonlon. As far as I am concerned, Bernard Folon was a man from Kumbo, Bui Division. I knew his father, mother, and I lived virtually with him for a long time. He was my friend. He adopted me and we were very close. And what kind of person was he? When Fonlon was growing up, he wanted to be a priest. But when he reached the point where he had to be ordained at Major Seminary, Enugu, they disappointed him. Did they give any reason for not ordaining him? The reasons were mixed, though he was not made a priest, he lived like a priest. How did his life and teachings influence his students and society? He was a man of his own kind, a seminarian and though he was not ordained, he remained attached to the church and he wrote a book to ameliorate the teachings in the seminary. He wanted that seminarians should not behave the way they liked, but more profound in their studies. He thought the teaching ought to be higher than what was obtained at the time. How did you feel when you learned of Prof. Fonlon’s passing? He died in Canada. I was here and I went and received the corpse at the airport, took the coffin to his house and opened it for viewing and paying of last respects. It didn’t occur to me that Fonlon was dead. Even after seeing the corpse, you didn’t believe he was dead? After taking the corpse from the airport to his residence in Yaounde and later to his house in kumbo, it was his sister who told me, you are behaving as if your friend is not dead, as if he is just sleeping. Do you know that you will now be walking alone? Then it occurred to me that Fonlon had died and that I would bury him the next day and that I should think differently. Then I collected some of the documents people left behind and some were published in a book and I burried Fonlon the next day in church behind the Cathedral in Kumbo. What has been Fonlon’s legacy in Cameroon? I remember that Folon taught many students, I remember Nalova Lyonga, (the Vice Chancellor of the University of Buea). Fonlon was directing her thesis when he died, and I think when Fonlon was going to the University of Gwelt in Canada, Nalova went with him where he got his doctorate degree. I do remember I went to Canada to find out the cause of Fonlon’s death. How valid is his complaint of 1963 about the non-respect of terms of the union by French Cameroon today? No, Fonlon knew as far as the 1950s that the West Cameroon and East Cameroons would unite and that they would speak French. He bought the first French book with me at Bonaberi in Douala and took to the seminary in 1950. So he was learning French in the seminary. When he finished his studies in 1960, he came back – at that time Foncha was the Prime Minister of West Cameroon and Ahidjo the President of East Cameroon. When Ahidjo came to visit Foncha in West Cameroon – at that time I was in Buea – there was an issue because Ahidjo could not speak English and Foncha could not speak French. The only person who could speak both languages was Fonlon and the Prime Minister was in Fonlon’s office, so he became the interpreter for President Ahidjo and Prime Minister Foncha. And you, what do you remember Fonlon for? I remember him for many things; he was my friend, we ate together, we went to Douala together in 1950, and when he came back with a doctorate degree I was in Buea and the results came by telegraph. I was with him when he got his PhD from the University of Sorbonne. How did he influence your life? He was my senior [elder]. I learnt a lot from him, I served him, and he liked me. He told me many things and I saw him do many things, but I didn’t become a priest, I read medicine. Even when he was in the seminary, we exchanged correspondences. I was surprised he was not ordained a priest. He started seminary studies at Okwala Owerrinta in Owerri in Nigeria, where he did Philosophy and when he was about to do Theology, a bigger Memorial Seminary was opened in Enugu and he was in the first batch, and that is when he was not ordained after three years. When he was not ordained, why did he not get married? When he was not ordained, he went to Christ the King College Enugu, Onitsha, and was taken as a teacher and since he was not a Nigerian, the condition for further studies for a year was for him to teach for two years. But, Endeley intervened and told the Cameroon Government about the situation and he was given a Cameroonian scholarship. He got a BA in French and went to the University of Island for Masters. After that, he got a BA degree in education from Oxford and went back to Island for a PHD. But he wanted to be with the great thinkers like Leopold Sedar Senghor and that is how he went to Sorbonne. There, he attached himself to a journal, Naissance Africaine, a periodic publication that was read widely. Do you think cameroonians value what he brought, in terms of knowledge? Yes, they do. When he came, after his attachment to President Ahidjo as a translator/interpreter, he started the bilingual information office at the Presidency, and the President enrolled him at the Federal University of Yaounde, and when he finished serving as Minister, he went back to the university. 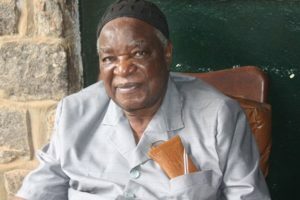 When he was at the University, he collaborated with the then Minister of Education, Eteki Mboumoua, and they founded ABIA Magazine – a private journal written in strict and rigouros conditions and he told Ahidjo that, for Cameroon to develop, he must allow Cameroonians to think freely and in ABIA, articles were in both English and French, and the last edition was published in 1982. Ahidjo funded the publication and I was appointed as Manager of the editorial board. What is the origin of the Kumbo Water Donation Crisis, and what do you think is the way forward? You know Kumbo is on the hills and people drank water from Rohkimbo or Bui, and to travel to get water was not easy. Fonlon’s mother was one of the women who joined the Catholic Church in 1914. She asked her son why he could not see the big man, President Ahidjo, to have water. Luckily, he had a friend, Omar Sendze, who was the Director of Public Works at the then Victoria and under him there was a water specialist called Himmlar. He was in charge of water projects and was sent to do a survey on where they could get water. He drew a plan and when Ahidjo and Fonlon were traveling to Canada, he already had a plan. So he asked Ahidjo to give him water to give his mother. (This is gossip. I was very close to him, so I know). Ahidjo said, no, I cannot give you water as a person. It has to go through the Prime Minister of West Cameroon, who was Solomon Tandeng Muna. When they got to Ottawa, Canada, he pleaded again for Ahidjo to ask the Canadians to give his people water. Ahidjo signed Fonlon’s draft plan and while the Presidents were discussing, Fonlon took the opportunity to see the Canadian Secretary, General Trudo, and presented the project signed by Ahidjo that they should give water to West Cameroon located in Kumbo which was to be the Kumbo Water Supply. The Canadians received the project very well and sent technicians to re-study the plan and the estimates and eventually gave water to Kumbo. That is how Fonlon gave water to his mothers. Now, how and from where is the current water crisis in Kumbo coming? Now, you can see how the water came about and this was water given by Fonlon to his mothers and the Fon, automatically, takes it because he is the ruler of Kumbo. I was there when it was constructed and during inauguration, it was a big day in Kumbo. Fonlon was there, the Fon of Nso and chiefs, Himmlar, the Canadian Embassy, Elangwe who was in charge of water and energy, public works technicians, and so on. I remember Cameroon gave a gown to the Canadian and every guest had a gift. We thanked Government for the gesture. Fonlon brought the water and the question then was: what shall we give to our son? He was crowned as ‘Shu-Fai Wo Ntoh Ndzev’ (water source) and he was taken to the Nwerong house and elevated to that rank. Should Kumbo people pay for the water? Water requires maintenance. So, people must pay some minimum sum. It was a technical project, so, an amount is needed for technical maintenance. Should SNEC take over the water supply? We thought SNEC was a technical body operating in Yaounde and we thought they should take over, but since it was directed by the Canadians, the people resisted that they could maintain the water. But today, there are so many problems about the water…? There is confusion about who maintains the water; the people still say Fonlon brought them the water, but the Canadians did warn that, after 30 years, the pipes should be changed. At a certain time, the Fon asked the Council to help in maintenance. But recently, the Council and the Fon fell out and the Fon still said they were maintaining the water and that they have authority over the water. I am a medical doctor and the solution is that people should drink clean and purified water. The Fon does not have the resources, and so also the Council does not have the resources to change the pipes, therefore, the Council should allow it to those who can maintain it. We may have to invite SNEC. We have a Ministry of Water and Energy that should supply water to the towns and they should take over the water supply in kumbo.